Just US$ 245.00 for the complete file. Target Businesses in New York State with the most accurate data available. This Business List is your most comprehensive and up-to-date resource for finding new sales prospects in New York State . 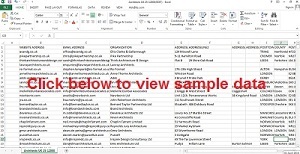 The List includes details such website, email address contacts, street address and telephone numbers – vital business intelligence to help you reach your target market audience and achieve better returns on your marketing investment. ~ 13 % of records with partial address – all records include State and Email Addresses. That’s why we offer our 100% guarantee of deliverability for both the Email and CASS Verified Street addresses listed. You’ll receive a full refund for any portion of the records that are undeliverable. See our Terms and Conditions page for full details. To quickly obtain relevant, up to date and accurate details of 1,000’s of sales prospects, simply click the “Add to Cart” button below and follow the delivery and payment details in the Shopping Cart.